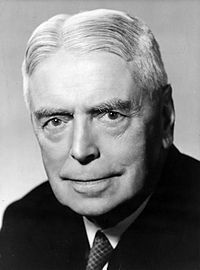 Sir Walter Nash GCMG CH PC (12 February 1882 – 4 June 1968) was a New Zealand politician who served as the 27th Prime Minister of New Zealand in the Second Labour Government from 1957 to 1960. He is noted for his long period of political service, having been associated with the New Zealand Labour Party since its creation. Nash was born in Kidderminster, England, and is the most recent New Zealand prime minister to be born outside the country. He arrived in New Zealand in 1909, soon joined the original Labour Party, and became a member of the party's executive in 1919. Nash was elected to Parliament in the Hutt by-election of 1929. He was from the moderate wing of the Labour Party. Appointed as Minister of Finance in 1935, Nash guided the First Labour Government's economic recovery programme during the Great Depression and then directed the government's wartime controls. He succeeded Peter Fraser as Leader of the Labour Party and Leader of Opposition in 1951. In the 1957 election, the Labour Party won a narrow victory and Nash became Prime Minister. The Second Labour Government's "Black Budget" of 1958, in response to a balance of payments crisis, increased taxes on luxuries such as beer and tobacco. Public hostility toward the budget contributed to Labour's heavy defeat in the 1960 election. Leaving office at 78 years of age, Nash is to date New Zealand's most elderly prime minister. Nash was born in Kidderminster, a town in the English county of Worcestershire. He was born into a poor family and his father was an alcoholic. Nash performed well at school and won a scholarship to King Charles I Grammar School but additional costs associated with attending prevented him from accepting. Nash began employment as a clerk, initially with a lawyer in Kidderminster and then at a factory near Birmingham. On 16 June 1906, Nash married Lottie May Eaton (17 March 1880 – 12 December 1961) and established a shop. He became highly active in his community, participating in a large number of societies and clubs. He also attended night school to further his education. By 1908, however, problems began to arise; his wife and son were both ill and a daughter died at birth. In addition an economic recession in the following year seriously harmed his business. The family decided to leave England, settling on New Zealand as a destination. After arriving in Wellington, in May 1909, Nash became secretary to a local tailor. His wife had two more sons. Nash's religious and political beliefs also began to solidify at this point, with the strong Christian faith he received from his mother being merged with a growing belief in socialism. Nash would remain a "Christian Socialist" for the remainder of his life, believing that the two components were inseparable. His political opinions were influenced by his friendship with prominent New Zealand socialists such as Michael Joseph Savage, Bob Semple and Harry Holland. Nash also became a committed pacifist. Nash's financial situation deteriorated, however, when the tailor's firm that he worked for (and was a shareholder of) declined. Nash and his family moved to Palmerston North where he became a salesman for a wool and cloth merchant. Later he established a tailoring company in New Plymouth along with Bill Besley, a tailor from Stratford, although the business performed poorly. Nash had briefly been involved with the first Labour Party, established in 1910, but this association had been interrupted by his financial difficulties. In 1918, however, he helped to establish the New Plymouth branch of the modern Labour Party and he became highly active. The following year Nash was elected to the party's national executive. In 1920 Nash and his wife travelled to Europe, attending various socialist conferences. When they returned to New Zealand, in January 1921, Nash was fined for importing "seditious literature". Despite the reputation that this fine gave him, among his fellow socialists, Nash was one of the more moderate members of the Labour Party. In 1922, a year after he had returned to Wellington, Nash was elected national secretary of the Labour Party. On arrival the party was found to have an all up debt of £220. The debt was settled when, together with Nash's own loan, John Glover (manager of Maori Lands) lent some £100 interest free. He is often credited with turning the Labour Party into a fully functioning entity; establishing an efficient organisational structure and paying off the party's debts. Following his announcement of "fifty thousand shillings and fifty thousand members in three months" in the Maoriland Worker he worked hard to increase the party's membership. Nash stood for election in the Hutt electorate in the 1925 and 1928 elections, but was not successful until the 1929 by-election. He also contested the Wellington mayoralty in 1929. In Parliament Nash became one of Labour's main finance spokesmen. When Labour, led by Michael Joseph Savage, won the 1935 elections Nash was appointed to Cabinet as Minister of Finance, although he also held a number of more minor positions. He was ranked third in the First Labour Government, with only Savage and Peter Fraser above him. New Zealand's economy was in poor shape at the time of Nash's appointment as Finance Minister and he was very busy for the early part of his ministerial career. Nash introduced a number of substantial changes, in an attempt to improve the situation. He reintroduced a graduated land tax at high rates and supervised the nationalisation of the Reserve Bank of New Zealand. In 1936 Nash departed for England to conduct trade negotiations. He also visited Berlin and Moscow. Nash resisted the immigration of Jewish refugees to New Zealand, citing a concern that "anti-Semitism, never far from the surface, was very apt to emerge in the case of the talented race whose members can often beat us at our own game, especially the game of money making." After returning to New Zealand he became involved in disputes within the Labour Party about economic policy. In particular he was heavily criticised by supporters of the social credit movement who wanted their views adopted as Labour Party policy. 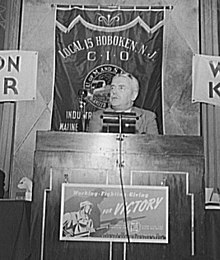 Nash was also attacked by the more radical socialists in the party who saw Nash's pragmatic economic policies as too moderate. Nash, however, was supported by both Savage and Fraser and emerged relatively unscathed. He gained the additional responsibility of implementing Labour's social security plan. With Savage seriously ill, the first years of World War II were difficult for the Labour Party. Further problems were caused by John A. Lee, a Labour Party member who launched strong attacks on its economic policy. Lee was particularly vicious towards Savage and Nash. Peter Fraser became Prime Minister after Savage's death and Lee was expelled. Nash, himself, reluctantly abandoned his earlier pacifism, deeming the war a necessary one. 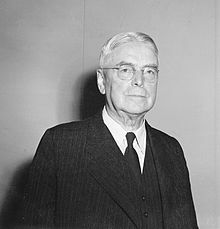 Nash was appointed Minister to the United States as New Zealand's diplomatic representative in the United States in 1942, but as Minister of Finance frequently returned to Wellington. So Geoffrey Cox the chargé d’affairs was head of the legation for 11 of the 21 months that Cox was in the United States. 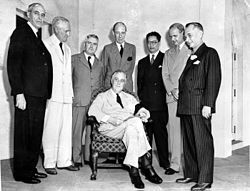 At the end of the war Nash attended the conferences to create the United Nations and also recommended that New Zealand join the International Monetary Fund. As the 1949 election approached, however, the Labour government was becoming increasingly unpopular. Industrial strife and inflation were major causes. In the election the opposition National Party, led by Sidney Holland, won power. Nash, however, retained his seat. Shortly after the election Fraser died. Nash was elected leader of the Labour Party unopposed. The first major test of his leadership came with the waterfront dispute of the same year, where major strikes were damaging the economy. Labour's position on the matter was seen as indecisive—the party was condemned by many workers for giving them insufficient support but at the same time was condemned by the business community for being "soft" on the communist-influenced unions. Labour suffered badly in the snap election that Holland called in 1951 to reaffirm his mandate. As Leader of the Opposition Nash is not generally regarded as having been a success. His primary talent appeared to have been in organisation and finance, and not in the inspirational leadership that Savage and Fraser provided. He was also seen as too slow in coming to decisions. In 1953 several MPs attempted an abortive coup to remove the 71-year-old Nash as leader. They included Rex Mason, Bill Anderton and Arnold Nordmeyer. Nash was told by Mason that number of members had complained about the leadership of the party to him and that Mason thought that the majority wanted a new leader. In 1954 a majority of the caucus was in favour of a new leader but pressure from the unions and continued support from Party branches allowed Nash to survive the subsequent vote. As the National government began to grow more unpopular Labour regained some of its earlier dynamism. In the 1957 election the party won a narrow victory—41 seats to 39— assisted by its promises of tax rebates and the abolition of compulsory military training. 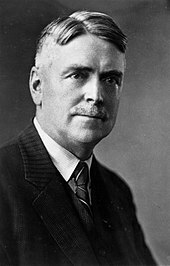 At the age of 75, Nash became Prime Minister of the Second Labour Government. When Nash and the Second Labour Government took office the country's financial situation was found to be worse than the previous government had admitted, with balance of payments a serious concern. Nash decided that drastic measures would be necessary to bring the situation back under control. These measures resulted in the so-called "Black Budget", presented by Arnold Nordmeyer the new Minister of Finance. The budget included significant tax increases and generated widespread public anger. This was fuelled by the National Party claiming that Nash and Nordmeyer were exaggerating the extent of the problem. The fact that the extra taxes were largely on petrol, cigarettes and beer contributed to the image of Nash's government as miserly. The situation was exacerbated by Nash's frequent absences from the country, leaving Nordmeyer and other Labour ministers to defend the government's policies themselves. Nash was also criticised for failing to act in the controversy over the 1960 rugby tour of South Africa, which country was under an Apartheid government. On the insistence of the South Africans the New Zealand team included no Māori players, prompting a petition against the tour supported by almost 10% of New Zealanders. Nash, however, refused to step in, saying that the matter was for the rugby authorities to decide. In the 1960 election, Labour was defeated by the National Party and Nash became Leader of the Opposition once again. Nash, now nearly eighty years old, was not as active as he once had been. The death of his wife in 1961 also took its toll. Gradually, calls for him to retire grew more frequent. 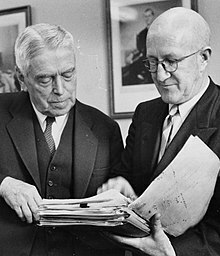 Nash, however, refused to step down, partly because of a desire to continue his work, and partly due to a reluctance to see Arnold Nordmeyer succeed him. In 1963, however, Nash finally retired as leader of the Labour Party and Nordmeyer was chosen to replace him. 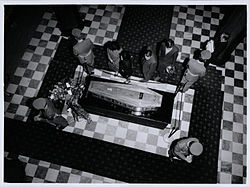 Nash had favoured Jerry Skinner and then Fred Hackett to replace him (see New Zealand general election, 1963), but first Skinner and then Hackett died unexpectedly. Nash remained the MP for Hutt until his death. He became active in the protest movement against the Vietnam War, and denounced the bombing of North Vietnam by the United States. Funds for a children's ward at a hospital in Qui Nhon, Vietnam, serve as a memorial to him. He died on 4 June 1968. He purchased an excellent cellar from a wealthy man. His cook, Margaret Moore, introduced him to 'old fashioneds' which, so he pretended, consisted of fruit juice. His taste for good food and drink expanded with opportunity – not that this had been lacking, for instance on his missions in the nineteen-thirties. It was generally supposed in New Zealand that Nash was a 'wowser', opposed to such human pleasures. This was so of Fraser, but quite untrue of Nash. He loved his food, and enjoyed good wine and liquor in moderation. Nash's great-grandson, Stuart Nash entered parliament in 2008 as a List MP for Labour. He was not re-elected in 2011 because of his low list position (27), but returned to parliament as electorate MP for Napier in 2014 and in 2017 became Minister of Police, Revenue, Small Business and Fisheries. In 1935 Nash was awarded the King George V Silver Jubilee Medal. In 1946 he was appointed to the Privy Council. He was appointed a Member of the Order of the Companions of Honour in the 1959 Queen's Birthday Honours and in the 1965 Queen's Birthday Honours he was made a Knight Grand Cross of the Order of St Michael and St George. In 1957 he also received the highest distinction of the Scout Association of Japan, the Golden Pheasant Award. ^ a b c d e f g h i j k l m n Gustafson, Barry. "Nash, Walter". Dictionary of New Zealand Biography. Ministry for Culture and Heritage. Retrieved 26 August 2013. ^ Goldsmith, Paul (2 September 2016). "Post-war taxation – 1950 to 1959". Te Ara: The Encyclopedia of New Zealand. Retrieved 28 March 2018. ^ "Lottie May Nash". geni_family_tree. Retrieved 13 February 2018. ^ "Lottie May (Eaton) Nash (1880-1961) - WikiTree FREE Family Tree". www.wikitree.com. ^ a b Sinclair 1976, p. 64. ^ Wilson 1985, p. 223. ^ a b Goldsmith, Paul (2 September 2016). "First Labour government taxes – 1935 to 1949". Te Ara: The Encyclopedia of New Zealand. Retrieved 28 March 2018. ^ Beaglehole 1988, p. 16. ^ Cox, Geoffrey (1999). Eyewitness: A memoir of Europe in the 1930s. Dunedin: University of Otago Press. p. 278. ISBN 1 877133 70 1. ^ "HGR Mason: Father of New Zealand's decimal currency system". We Love Pukekohe. 24 April 2014. Retrieved 20 June 2015. ^ "General elections 1890-1993". New Zealand Electoral Commission. Retrieved 29 March 2018. ^ a b Sethi, Rishab; McDermott, John C. (11 March 2010). "Balance of payments - What is the balance of payments?". Te Ara : The Encyclopedia of New Zealand. Retrieved 28 March 2018. ^ Hurley, Desmond (2000). A Dictionary of New Zealand Political Quotations. Oxford University Press. p. 55. ISBN 0 19 558 4287. ^ Sinclair 1976, p. 221. ^ a b Trevett, Claire Trevett; Davison, Isaac (3 October 2014). "Nash eyes standing for leadership". The New Zealand Herald. Retrieved 29 March 2018. ^ "Official jubilee medals". The Evening Post. 6 May 1935. p. 4. Retrieved 16 November 2013. ^ "No. 37407". The London Gazette (Supplement). 1 January 1946. p. 1. ^ "No. 41727". The London Gazette (Supplement). 13 June 1959. p. 3723. ^ "No. 43669". The London Gazette (Supplement). 12 June 1965. p. 5513. ^ "䝪䞊䜲䝇䜹䜴䝖日本連盟 きじ章受章者" (PDF). Reinanzaka-sc.o.oo7.jp. Retrieved 1 December 2016. Sinclair, Keith (1976). Walter Nash. Auckland: Oxford University Press. ISBN 0-19-647949-5. Mackenzie, Craig (1975). Walter Nash, Pioneer and Prophet. Dunmore Press. Beaglehole, Ann (1988). A Small Price to Pay: Refugees from Hitler in New Zealand 1936–1946. Allen & Unwin. Wikimedia Commons has media related to Walter Nash. This page was last edited on 1 March 2019, at 18:47 (UTC).